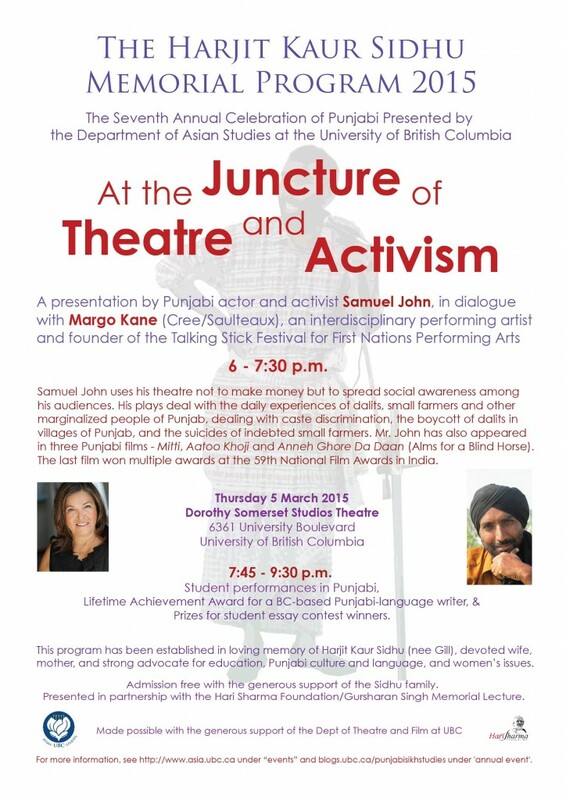 A presentation by Punjabi actor and activist Samuel John, in dialogue with Margo Kane (Cree/Saulteaux), an interdisciplinary performing artist and founder of the Talking Stick Festival for First Nations Performing Arts. Samuel John uses his theatre not to make money but to spread social awareness among his audiences. His plays deal with the daily experiences of dalits, small farmers and other marginalized people of Punjab, dealing with caste discrimination, the boycott of dalits in villages of Punjab, and the suicides of indebted small farmers. Mr. John has also appeared in three Punjabi films – Mitti, Aatoo Khoji and Anneh Ghore Da Daan (Alms for a Blind Horse). The last film won multiple awards at the 59th National Film Awards in India. Free with the generous support of the Sidhu family. Presented in partnership with the Hari Sharma Foundation/Gursharan Singh Memorial Lecture. This program has been established in loving memory of Harjit Kaur Sidhu (nee Gill), devoted wife, mother, and strong advocate for education, Punjabi culture and language, and women’s issues. Student essay contest winners and the winner of a Lifetime Achievement Award for a BC-based Punjabi-language writer will be honored at the event. Made possible with the generous support of the Department of Theatre and Film at UBC.